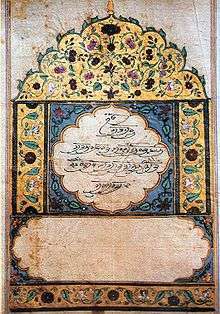 Illuminated Guru Granth Sahib folio with nisan (Mul Mantar) of Guru Gobind Singh. Guru Granth Sahib (Punjabi (Gurmukhi): ਗੁਰੂ ਗ੍ਰੰਥ ਸਾਹਿਬ ਜੀ, Punjabi pronunciation: [ɡʊɾu ɡɾəntʰ sɑhɪb], /ˈɡʊəruː ɡrɑːnθ səˈhɪb/) is the central religious scripture of Sikhism, regarded by Sikhs as the final, sovereign and eternal living Guru following the lineage of the ten human Gurus of the religion. The Adi Granth, the first rendition, was compiled by the fifth Sikh Guru, Guru Arjan (1563–1606). Guru Gobind Singh, the tenth Sikh Guru, did not add any of his own hymns; however, he added all 115 of Guru Tegh Bahadur's hymns to the Adi Granth, and affirmed the text as his successor. This second rendition became known as Guru Granth Sahib. After Guru Gobind Singh died, Baba Deep Singh and Bhai Mani Singh prepared many copies of the work for distribution. The text consists of 1430 Angs (pages) and 6,000 śabads (line compositions), which are poetically rendered and set to a rhythmic ancient north Indian classical form of music. The bulk of the scripture is classified into thirty one rāgas, with each Granth rāga subdivided according to length and author. The hymns in the scripture are arranged primarily by the rāgas in which they are read. The Guru Granth Sahib is written in the Gurmukhī script, in various dialects – including Lahnda (Western Punjabi), Braj Bhasha, Khariboli, Sanskrit, Sindhi and Persian – often coalesced under the generic title of Sant Bhasha. Guru Granth Sahib is predominantly compositions by six Sikh Gurus: Guru Nanak, Guru Angad, Guru Amar Das, Guru Ram Das, Guru Arjan and Guru Teg Bahadur. It also contains the traditions and teachings of thirteen Hindu Bhakti movement sants (saints), such as Ramananda and Namdev among others, and two Muslim saints – namely Kabir and the Sufi Sheikh Farid. The vision in the Guru Granth Sahib, states Torkel Brekke, is a society based on divine justice without oppression of any kind. While the Granth acknowledges and respects the scriptures of Hinduism and Islam, it does not imply a syncretic bridge between Hinduism and Islam. It is installed in a Sikh gurdwara (temple); many Sikhs bow or prostrate before it on entering the temple. The Granth is revered as eternal gurbānī and the spiritual authority in Sikhism. During the guruship of Guru Nanak, collections of his hymns were compiled and sent to distant Sikh communities for use in morning and evening prayers. His successor, Guru Angad, began collecting his predecessor's writings. This tradition was continued by the third and fifth gurus as well. When the fifth guru, Guru Arjan, was collecting the writings of his predecessor, he discovered that pretenders to the guruship were releasing what he considered as forged anthologies of the previous guru's writings and including their own writings alongside them. In order to prevent spurious scriptures from gaining legitimacy, Guru Arjan began compiling a sacred book for the Sikh community. He finished collecting the religious writings of Guru Ram Das, his immediate predecessor, and convinced Mohan, the son of Guru Amar Das, to give him the collection of the religious writings of the first three gurus. In addition, he sent disciples to go across the country to find and bring back any previously unknown writings. He also invited members of other religions and contemporary religious writers to submit writings for possible inclusion. Guru Arjan selected hymns for inclusion into the book, and Bhai Gurdas acted as his scribe. While the manuscript was being put together, Akbar, the Mughal Emperor, received a report that the manuscript contained passages vilifying Islam. Therefore, while travelling north, he stopped en route and asked to inspect it. Baba Buddha and Bhai Gurdas brought him a copy of the manuscript as it then existed. After choosing three random passages to be read, Akbar decided that this report had been false. In 1604 Guru Arjan's manuscript was completed and installed at the Harmandir Sahib with Baba Buddha as the first granthi, or reader. Since communities of Sikh disciples were scattered all over northern India, copies of the holy book needed to be made for them. The sixth, seventh, and eighth gurus did not write religious verses; however, the ninth guru, Guru Tegh Bahadur, did. The tenth guru, Guru Gobind Singh, included Guru Tegh Bahadur's writings into the Guru Granth Sahibbut did not include any of his own religious verses in the Guru Granth Sahib. In 1704 at Damdama Sahib, during a one-year respite from the heavy fighting with Aurengzeb which the Khalsa was engaged in at the time, Guru Gobind Singh and Bhai Mani Singh added the religious compositions of Guru Tegh Bahadur to Adi Granth to create a definitive version. The religious verses of Guru Gobind Singh were not included in Guru Granth Sahib, but some of his religious verses are included in the daily prayers of Sikhs. During this period, Bhai Mani Singh also collected Guru Gobind Singh's writings, as well as his court poets, and included them in a secondary religious volume, today known as the Dasam Granth Sahib This secondary text is not revered by the Sikhs, however, for whom only Guru Granth Sahib is Guru. Sikhs consider the Guru Granth Sahib to be a spiritual guide not only for Sikhs but for all of humanity; it plays a central role in guiding the Sikh's way of life. Its place in Sikh devotional life is based on two fundamental principles: that the text is the living Guru and that all answers regarding religion and morality can be discovered within it. Its hymns and teachings are called Gurbani or "Word of the guru" and sometimes Guru ki bani or "Word of Guru". Thus, in Sikh theology, the revealed divine word is written by the past Gurus. Numerous holy men, aside from the Sikh Gurus, are collectively referred to as Bhagats or "devotees." In 1708 Guru Gobind Singh conferred the title of "Guru of the Sikhs" upon the Adi Granth. The event was recorded in a Bhatt Vahi (a bard's scroll) by an eyewitness, Narbud Singh, who was a bard at the Rajput rulers' court associated with gurus. A variety of other documents also attest to this proclamation by the tenth Guru. Thus, despite some aberrations, Sikhs since then have accepted Guru Granth Sahib, the sacred book, as their eternal Guru . A composition or Shabad from Guru Granth Sahib. The entire Guru Granth Sahib is written in the Gurmukhi script, which was standardized by Guru Angad Dev in the 16th century . 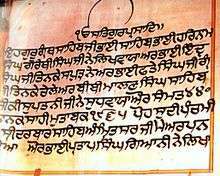 According to Sikh tradition and the Mahman Prakash, an early Sikh manuscript, Guru Angad invented the script at the suggestion of Guru Nanak during the lifetime of the founder. The word Gurmukhī translates to "from the mouth of the Guru". It descended from the Laṇḍā scripts and was used from the outset for compiling Sikh scriptures. 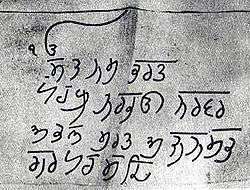 The Sikhs assign a high degree of sanctity to the Gurmukhī script. It is the official script for writing Punjabi in the Indian State of Punjab. Compositions of Sikh gurus, followed by those of the bhagats who know only God, collected according to the chronology of ragas or musical settings (see below). The word raga refers to the "color" and, more specifically, the emotion or mood produced by a combination or sequence of pitches. A raga is composed of a series of melodic motifs, based upon a definite scale or mode of the seven Swara psalmizations, that provide a basic structure around which the musician performs. Some ragas may be associated with times of the day and year. There are 31 ragas in the Sikh system, divided into 14 ragas and 17 raginis (minor or less definite ragas). Within the raga division, the songs are arranged in order of the Sikh gurus and Sikh bhagats with whom they are associated. The ragas are, in order: Sri, Manjh, Gauri, Asa, Gujri, Devagandhari, Bihagara, Wadahans, Sorath, Dhanasri, Jaitsri, Todi, Bairari, Tilang, Suhi, Bilaval, Gond (Gaund), Ramkali, Nut-Narayan, Mali-Gaura, Maru, Tukhari, Kedara, Bhairav (Bhairo), Basant, Sarang, Malar, Kanra, Kalyan, Prabhati and Jaijawanti. In addition there are 22 compositions of Vars (traditional ballads). Nine of these have specific tunes, and the rest can be sung to any tune. No one can change or alter any of the writings of the Sikh gurus written in the Adi Granth. This includes sentences, words, structure, grammar and meanings. Following the example of the gurus themselves, Sikhs observe total sanctity of the text of Guru Granth Sahib. Guru Har Rai, for example, disowned one of his sons, Ram Rai, because he had attempted to alter the wording of a hymn by Guru Nanak. Guru Har Rai had sent Ram Rai to Delhi in order to explain Gurbani to the Mughal Emperor Aurangzeb. To please the Emperor he altered the wording of a hymn, which was reported to the guru. Displeased with his son, the guru disowned him and forbade his Sikhs to associate with him or his descendants. A partial English translation of Guru Granth Sahib by Ernest Trumpp was published in 1877. The work was for use by Christian missionaries, and received extremely negative feedback from Sikhs. Max Arthur Macauliffe also partially translated the text for inclusion in his six-volume The Sikh Religion, published by Oxford University Press in 1909. His translations are closer to the Sikhs' own interpretation of the book, and were received well by them. The first complete English translation of Guru Granth Sahib, by Gopal Singh, was published in 1960. A revised version published in 1978 removed the obsolete English words like "thee" and "thou". In 1962, an eight-volume translation into English and Punjabi by Manmohan Singh was published by the Shiromani Gurdwara Parbandhak Committee. In the 2000s, a translation by Sant Singh Khalsa (referred to as the "Khalsa Consensus Translation") became popular through its inclusion on major Sikhism-related websites. 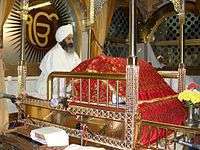 Guru Granth Sahib is always the focal point in any Gurudwara, being placed in the centre on a raised platform known as a Takht (throne), while the congregation of devotees sits on the floor and bow before the Guru as a sign of respect. Guru Granth Sahib is given the greatest respect and honour. Sikhs cover their heads and remove their shoes while in the presence of this sacred text. Guru Granth Sahib is normally carried on the head and as a sign of respect, never touched with unwashed hands or put on the floor. It is attended with all signs of royalty, with a canopy placed over it. 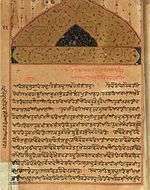 A chaur sahib is waved above the book. Peacock-feather fans were waved over royal or saintly beings as a mark of great spiritual or temporal status; this was later replaced by the modern Chaur sahib. The Guru Granth Sahib is taken care of by a Granthi, who is responsible for reciting from the sacred text and leading Sikh prayers. The Granthi also acts as caretaker for the Guru Granth Sahib, keeping the holy book covered in clean cloths, known as rumala, to protect from heat, dust, pollution, etc. The Guru Granth Sahib rests on a manji sahib under a rumala until brought out again. The editing of Guru Granth Sahib is done by the official religious body of Sikhs based in Amritsar. Great care is taken while making printed copies and a strict code of conduct is observed during the task of printing. Before the late nineteenth century, only handwritten copies were prepared. The first printed copy of the Guru Granth Sahib was made in 1864. Since the early 20th century, it has been printed in a standard edition of 1430 Angs. Any copies of Guru Granth Sahib deemed unfit to be read from are cremated, with a ceremony similar to that for cremating a deceased person. Such cremating is called Agan Bheta. Guru Granth Sahib is currently printed in an authorized printing press in the basement of the Gurudwara Ramsar in Amritsar; misprints and set-up sheets, and printer's waste with any of its sacred text on, are cremated at Goindval. Punjab Digital Library, in collaboration with the Nanakshahi Trust, began digitization of centuries-old manuscripts in 2003. ↑ Keene, Michael (2004). Online Worksheets. Nelson Thornes. p. 38. ISBN 0-7487-7159-X. ↑ Kapoor, Sukhbir. Guru Granth Sahib an Advance Study. Hemkunt Press. p. 139. ISBN 9788170103219. ↑ Pruthi, Raj (2004). Sikhism And Indian Civilization. Discovery Publishing House. p. 188. ↑ Penney, Sue. 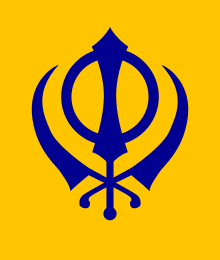 Sikhism. Heinemann. p. 14. ISBN 0-435-30470-4. ↑ Harnik Deol, Religion and Nationalism in India. Routledge, 2000. ISBN 0-415-20108-X, 9780415201087. Page 22. "(...) the compositions in the Sikh holy book, Adi Granth, are a melange of various dialects, often coalesced under the generic title of Sant Bhasha." The making of Sikh scripture by Gurinder Singh Mann. Published by Oxford University Press US, 2001. ISBN 0-19-513024-3, ISBN 978-0-19-513024-9 Page 5. "The language of the hymns recorded in the Adi Granth has been called Sant Bhasha, a kind of lingua franca used by the medieval saint-poets of northern India. But the broad range of contributors to the text produced a complex mix of regional dialects." Surindar Singh Kohli, History of Punjabi Literature. Page 48. National Book, 1993. ISBN 81-7116-141-3, ISBN 978-81-7116-141-6. "When we go through the hymns and compositions of the Guru written in Sant Bhasha (saint-language), it appears that some Indian saint of 16th century...."
Introduction: Guru Granth Sahib. "Guru Granth Sahib Ji is written in Gurmukhi script. The language, which is most often Sant Bhasha, is very close to Punjabi. It is well understood all over northern and northwest India and is popular among the wandering holy men. Persian and some local dialects have also been used. Many hymns contain words of different languages and dialects, depending upon the mother tongue of the writer or the language of the region where they were composed." Nirmal Dass, Songs of the Saints from the Adi Granth. SUNY Press, 2000. ISBN 0-7914-4683-2, ISBN 978-0-7914-4683-6. Page 13. "Any attempt at translating songs from the Adi Granth certainly involves working not with one language, but several, along with dialectical differences. The languages used by the saints range from Sanskrit; regional Prakrits; western, eastern and southern Apabhramsa; and Sahiskriti. More particularly, we find sant bhasha, Marathi, Old Hindi, central and Lehndi Panjabi, Sgettland Persian. There are also many dialects deployed, such as Purbi Marwari, Bangru, Dakhni, Malwai, and Awadhi." Harjinder Singh, Sikhism. Guru Granth Sahib (GGS). "Guru Granth Sahib Ji also contains hymns which are written in a language known as Sahiskriti, as well as Sant Bhasha; it also contains many Persian and Sanskrit words throughout." ↑ Shapiro, Michael (2002). Songs of the Saints from the Adi Granth. Journal Of The American Oriental Society. pp. 924, 925. ↑ Parrinder, Geoffrey (1971). World Religions: From Ancient History to the Present. United States: Hamlyn. p. 256. ISBN 978-0-87196-129-7. ↑ Singh, Khushwant (1991). A history of the Sikhs: Vol. 1. 1469-1839. Oxford University Press. p. 34. Retrieved 18 December 2011. 1 2 3 Singh, Khushwant (1991). A history of the Sikhs: Vol. 1. 1469-1839. Oxford University Press. pp. 54–56,294–295. Retrieved 18 December 2011. ↑ Trumpp, Ernest (2004) . The Ādi Granth or the Holy Scriptures of the Sikhs. India: Munshiram Manoharlal Publishers. p. 1xxxi. ISBN 978-81-215-0244-3. 1 2 3 4 5 6 Singh, Khushwant (1991). A history of the Sikhs: Vol. 1. 1469-1839. Oxford University Press. pp. 54–55,90,148,294–296. Retrieved 18 December 2011. ↑ McLeod, W. H. (1990-10-15). Textual sources for the study of Sikhism. University of Chicago Press. ISBN 9780226560854. Retrieved 11 June 2010. ↑ Singh, Gurbachan; Sondeep Shankar (1998). The Sikhs : Faith, Philosophy and Folks. Roli & Janssen. p. 55. ISBN 81-7436-037-9. ↑ Hoiberg, Dale; Indu Ramchandani (2000). Students' Britannica India. Popular Prakashan. p. 207. ISBN 0-85229-760-2. ↑ Gupta, Hari Ram (2000). History of the Sikhs Vol. 1; The Sikh Gurus, 1469-1708. Munshiram Manoharlal Publishers (P) Ltd. p. 114. ISBN 81-215-0276-4. ↑ Mann, Gurinder Singh (2001). The making of Sikh Scripture. Oxford University Press. p. 5. ISBN 0-19-513024-3. 1 2 3 Brown, Kerry (1999). Sikh Art and Literature. Routledge. p. 200. ISBN 0-415-20288-4. ↑ Giriraj, Ruhel (2003). Glory Of Indian Culture. Diamond Pocket Books (P) Ltd. p. 96. ISBN 9788171825929. ↑ Amrita, Priyamvada (2007). Encyclopaedia of Indian music. p. 252. ISBN 9788126131143. ↑ Bains, K.S. "A tribute to Bal Guru". The Tribune. ↑ Nikky-Guninder Kaur Singh (22 February 2011). Sikhism: An Introduction. I.B.Tauris. pp. 128–. ISBN 978-0-85773-549-2. ↑ John Stratton Hawley (1993). Studying the Sikhs: Issues for North America. SUNY Press. pp. 164–. ISBN 978-0-7914-1425-5. ↑ Lynne Long (2005). Translation and Religion. Multilingual Matters. pp. 50–51. ISBN 978-1-84769-550-5. 1 2 Fowler, Jeaneane (1997). World Religions:An Introduction for Students. Sussex Academic Press. pp. 354–357. ISBN 1-898723-48-6. ↑ Jolly, Asit (2004-04-03). "Sikh holy book flown to Canada". BBC News. Retrieved 2010-01-05.